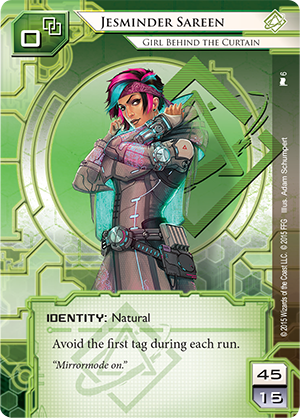 Fear the Masses, the sixth and final Data Pack in the Mumbad Cycle for Android: Netrunner, is now available at retailers throughout the United States and online via our webstore! Over the course of the Mumbad Cycle, we've caught glimpses of an Indian Union sharply divided by the issue of clone rights. We've seen Jinteki pushed to the edge and desperately fighting to shape the debates. 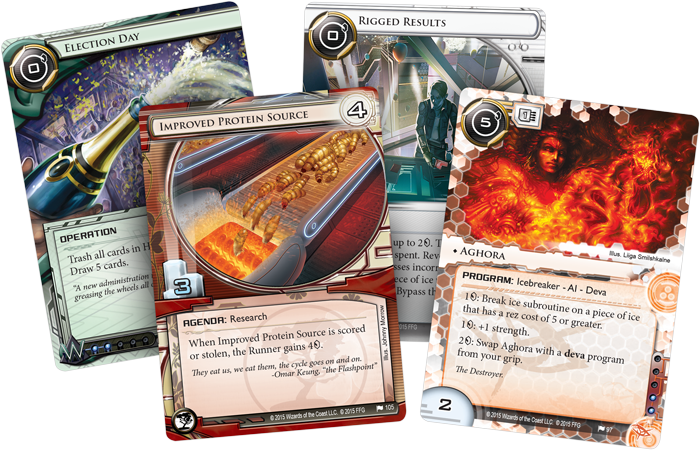 We've seen Haas-Bioroid maneuvering to take advantage of Jinteki's troubles. And we've seen the other corps prosper from the alliances they've made during this time of uncertainty. Simultaneously, the election season has bought with it a wealth of opportunities for daring runners. So the Mumbad Cycle has introduced us to a pair of runners who have aimed to interfere with the elections in entirely different ways. There's the Criminal Nero Severn (Democracy and Dogma, 40) who collects information to use it for leverage. Then there's the Shaper Jesminder Sareen (Kala Ghoda, 6) whose interest is primarily in protecting her sister's privacy and well-being, as well as protecting her campaign from the attacks made by other runners. 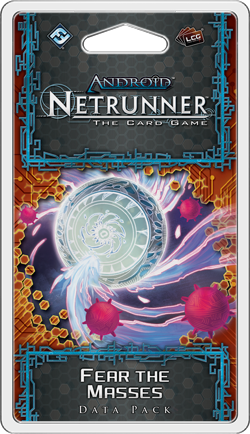 At its root, Android: Netrunner is a game of bluffs and economy, and as anyone with even a passing interest in economics would tell you, nothing is free. Nothing is free. Nothing comes free. And anyone trying to give you something for free is playing an angle. There's a cost to install your icebreaker. There's a cost to power it up on your run. There's a cost to make new connections among Mumbad's elite. And there's a price you pay for trying to change the culture of the world's most populous democracy. More than that, if the new card, The Price of Freedom (Fear the Masses, 100) is right, that price might even be your life. Propelled by their impassioned support of clone rights and what they would mean for the future of the Indian Union, Akshara Sareen (Democracy and Dogma, 46) and the Ēkatā Party were able to win the national election. It was a giant step forward. 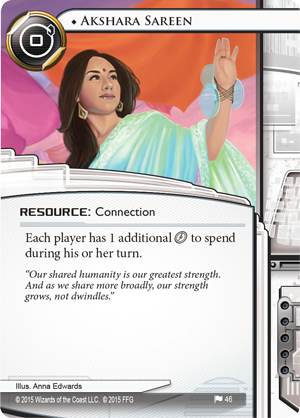 And then, during her acceptance speech, Akshara was assassinated, Jesminder Sareen ran onto the stage to hold her sister in her arms, and the future of the clone rights movement was thrown into question. Akshara's death leaves the Ēkatā Party reeling. She had been its face and its spiritual leader, and no one is certain whether the party will still have the vision and political capital it needs to effect change in the legislature. 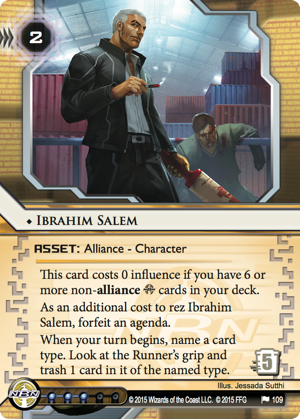 Krishnan Sareen stands to take his sister's mantle, but others in the party might contest his ascension. No one knows in what direction the new leader plans to take the party. In the meantime, there are questions to be answered. Who assassinated Akshara? Who ordered the hit? Will anyone be brought to justice? Naturally, the execs at Jinteki can expect to find themselves under close scrutiny. But if the hit on Akshara shocks the nation enough to distract its people from the issues, Jinteki's execs might allow themselves to enjoy a few secret sighs of relief. Even if they know they won't be pushing forward with any big agendas in the immediate future. 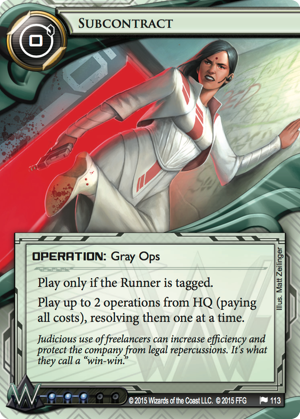 The Price of Freedom costs the runner a click and a connection, but it can cost the Corp a whole lot more. The general consensus is that the Runner has the advantage in the early-game when the Corp hasn't yet set up its protections and, then again, in the late-game when the Corp might have set up its defenses, but the Runner has established an economy and rig that allows him or her to hack through everything, anyway. 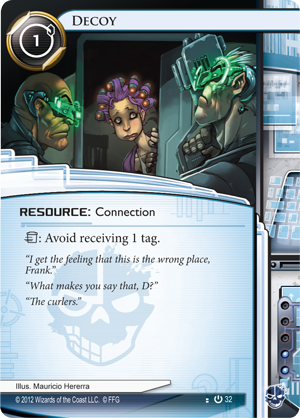 The Corp, it is said, has the advantage in the mid-game, when it has secured a couple of servers and the Runner has to dig for breakers. When the Runner can't break through the Corp's defenses, these are the times the Corp has its scoring windows. And they're exactly the moments The Price of Freedom counteracts. 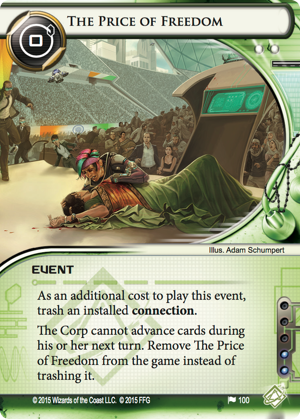 By trashing Akshara or a Decoy (Core Set, 32) to play The Price of Freedom, you can buy yourself three clicks to power through the Corp-friendly mid-game toward the Runner-friendly end-game. 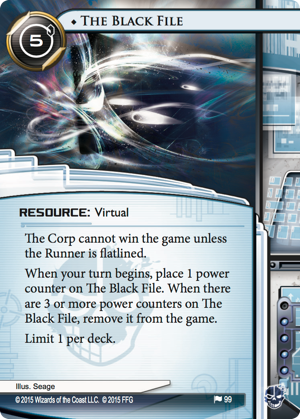 And if you can do that while leveraging a few secrets in The Black File (Fear the Masses, 99), you might be able to buy yourself several turns of running during which the Corp can't win by scoring agendas. The election is over. The people of the Indian Union have cast their votes, and the Ēkatā Party has won. But the assassination of Akshara Sareen throws everything back into question. What will be the fate of the Ēkatā Party? What will be the fate of the clone rights movement? 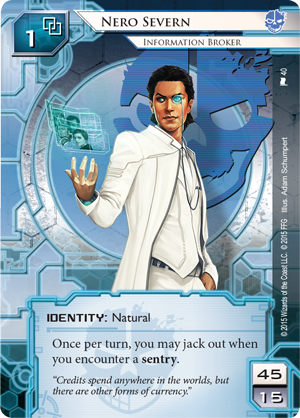 What will be the fates of Jinteki and the worlds other biggest corporations? With Fear the Masses, you'll discover how a handful of individuals like Akshara Sareen, Monica Singh, and Ibrahim Salem (Fear the Masses, 109) can effect bold, sweeping changes in the Indian Union, and you'll have your chance to effect changes, as well. Pick up your copy of Fear the Masses today, and start working toward a better future… one of your design!